Gentle, effective therapy for pain. Aquatic Therapy provides a controlled environment for resistance and temperature-based treatment. Many patients are able to begin physical therapy sooner in our pool than they would with traditional therapy. This is because the buoyancy of the water helps to support the patient in an environment that is both safe and secure with less pain. The water also helps to eliminate the fear of falling that some patients experience when undergoing traditional physical therapy. Some of the diagnoses that our SwimEx Pool is especially beneficial in treating include: post total hip, knee, or shoulder replacements, post back surgeries, low-back pain, rotator-cuff rehab, and overuse injuries such as tendonitis and bursitis. The pool also works well with balance conditions related to gait training. 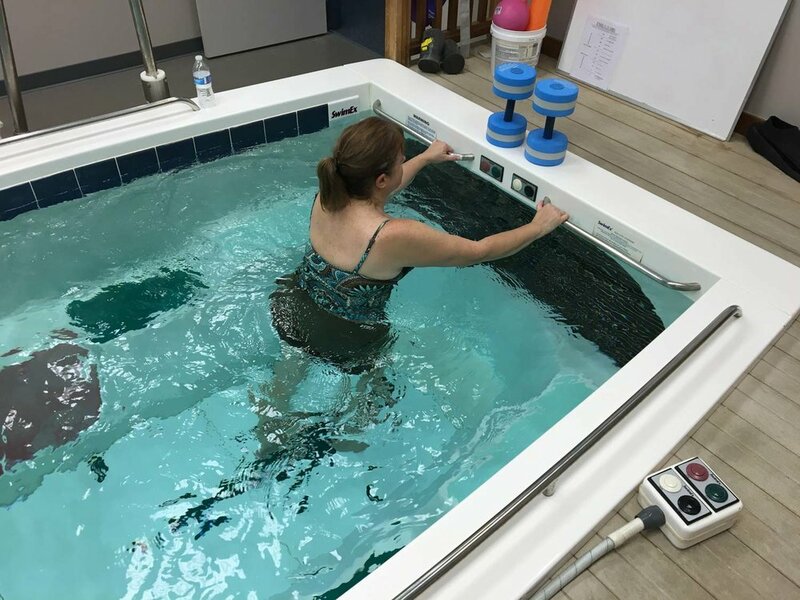 This state-of-the-art SwimEx Pool makes our facility a truly unique physical therapy outlet in Northeast Ohio and is a signature part of the WellFit experience.